Following the open beta, EA has updated their shipment expectations for the upcoming Star Wars Battlefront. The publisher now believes, they can ship 13 million units of the sci-fi shooter by the end of their current fiscal year. EA executive Blake Jorgensen, announced this during a post-earnings call. Jorgensen is the Chief Financial Officer at Electronic Arts. “Results exceeded our expectations again”, Jorgensen said. “Based on the ongoing strength of our business and reception of Star Wars Battlefront, we are raising out full-year outlook for the second time. Our markets are very healthy, the digital transition continues to drive margins, and engagement in our live services and excitement for our upcoming launches is exceptional”. The expected shipment of 13 million, is a lot more than EA’s previous forecast of roughly 9 to 10 million copies. 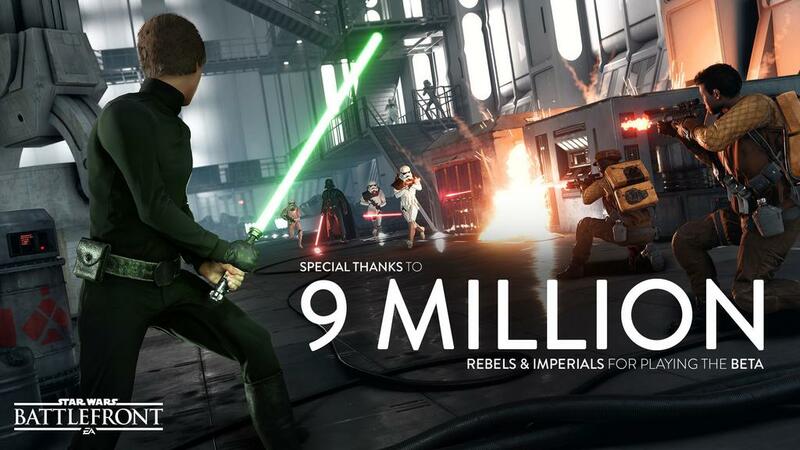 Over 9.5 million players joined the Battlefront open beta, according the report. According Jorgensen, around 75% of shipments are expected in the third quarter of FY2016. Jorgensen later corrected himself by expressing that the split between Q3 and Q4 is actually 80%/20%. Please note that the Battlefront forecast is based on shipped copies. This means the amount of copies that have been shipped to retailers, not sold units. This metric can sometimes be confusing, and has been used to give a positive spin on lower sales. Star Wars Battlefront will be releasing on November 17 for PC, Xbox One and PS4. For PC players, I suggest checking out this system spec post, to see if your rig has got what it takes to run Battlefront.